Hey everyone Brett here and today I want to talk about something that I think so many people miss about the IM business and making money online in general. First I want to show you all a picture. So what exactly is this picture and why is it important to the subject of this post? Well some of you know that I was away for a couple of days last week. Well here is what I was doing. I was down in Tennessee riding the ‘Tail of the Dragon’ (Deals Gap). 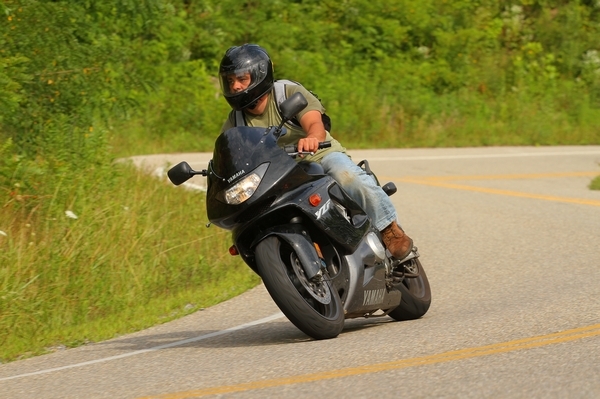 This is a picture that a local photographer took of me riding it. So why is that important? Well whats important is not exactly what I was doing its why I was able to do it. You see I went down for 3 days in the middle of the work week. I didn’t have to request time off of work, take personal days, or vacation time. I just decided I wanted to go so I jumped on my bike and rode down. Whats really cool is that because I make my living online I was still able to work. In fact I made more than double the cost of the trip from the hotel room at night while I was on the trip. What Im trying to get across in this post is that its not always about the money. Well at least not all about the money. For sure we all know there is a lot of cash to be made in IM. It bought that bike Im riding (and the other one that was at home in my garage, not to mention the garage itself, and the house that the garage came with). However there are other big advantages to making your living online. Let me explain. Everyday I see marketers talking about how they are going to teach people how to make tens of thousands of dollars a month. Well making a lot of money is all well and good but for me one of the biggest things about making my living online is the freedom. Because you can work as much or as little as you want and because you can litterly take your work where ever you go making your living online (and particularly the IM business) allows you to have a level of freedom that most people simply can not enjoy. In fact I made this trip alone. I had to. My friends all had to work. But not me (even though I still did at night from the hotel room). I want everyone to think of what a job really is. What are you doing when you work at a job? Most people are going to say that they are selling their labor to their employer in exchange for their wage. But I say that its not just your labor your selling. Its your life. Your selling your time. Unless you really love your job so much that there is nothing else you would prefer to do then that is exactly what you are doing. Your selling your life 8 hours at a time. Consider this. If you work 5 days a week, 8 hours a day, 50 weeks a year, for 30 years you have worked just under 7 years. That’s 7 years of your life gone and this does not include overtime work, going in early, time getting ready to go to work, travel time and winding down after a days work. But its even worse than that. When you work a regular you are constrained not only by your working hours but by your obligation to go to work. For example you cant just decide to go on a trip for 3 days on a Tuesday night pack a backpack full of clothes and a laptop and roll out the next morning. However when you make your money online you can. What Im trying to get across is that as I said its not just about making gobs of money. Sure making gobs of money is cool. But whats also very cool is making ‘enough’ money without having to grind away your life at some 9-5 job. So my tip today for everyone is to think hard not about making a million dollars a year, think about what you need to make to have some more freedom in your life and work towards getting that. Because in the end your life and your time is the most valuable thing you have and the one thing that once gone you can never get back. Great article. Too many people think about getting rich instead of the freedom that internet marketing can bring them and their families. Article is right on target. You have hit the nail on the head again Brett, Also i might add that being self employed and in the manufacturing business is even worse than being employed, at least if you are employed you have the weekend to get out and about. As you were i also have been stuck in a working whirlwind for nearly four years now. Working day and night 7 days a week, torn between physical work and online work, it seems to have stolen my life from under my feet. Seeing you on your bike made me smile with envy, as i also have two bike’s that have been collecting dust for to many years. So true! Cool pic Brett, yea there are a lot of things to do in that area of the country, I’ve spent a lot of time there myself.